1. DEFINITION: The visual field (VF) refers to the total area in which objects can be seen in the side (peripheral) vision with the focus on a central point. 2. ISLAND OF VISION: Traquair defined a visual field as “an island of vision surrounded by a sea of blindness”. Once we define the limits of the island, it can be monitored for progression. 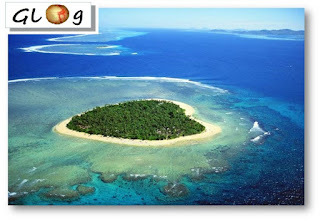 Thus, the boundaries of the island can shrink with worsening of glaucoma. The VF should not be confused with the “field of gaze” in which the eye is permitted to have rotational movement (keeping the head and body in a constant position). The “field of view” indicates the situation where the eye as well as the head can be moved. The shoreline (beach) of the island of vision corresponds to the peripheral limits of the VF. Using the maximum size of target stimulation, it normally measures 600 above and nasally, 70-750 below and 100-1100 temporal to the fixation point. It is therefore a horizontal oval. Within the boundaries of the normal VF is a deep depression, or “blind spot”, which corresponds to the optic nerve head. It is situated approximately 150 temporal to fixation. It has 2 portions: (a) an absolute scotoma (b) a relative scotoma. The absolute scotoma corresponds to the actual ONH and is seen as a vertical oval. 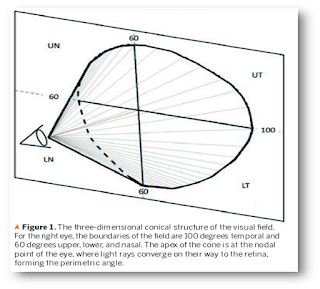 The relative scotoma surrounds the absolute area and corresponds to the peripapillary retina which has a reduced visual sensitivity, especially inferiorly and superiorly. This area depends on the stimulus value and varies with different testing methods. 3. BASIC PRINCIPLES: The basic principle of VF assessment involves the measuring of peripheral limits of the VF (boundaries), as well as the relative visual acuity of areas within those limits. The boundaries or contour lines are called “isopters”. The isopter connects points which have the same threshold. In other words, the isopter represents loci of equal differential light sensitivity (DLS) on the surface of the hill of vision. The standard unit of measurement in the VF is the DLS. It is defined as: “the threshold of perception of a test object, relative to it’s background”. The size and shape of a particular isopter depends (atleast in part) on the stimulus value of the test object. When 2 or more isopters closely approach one another, they indicate a relatively steep rise or fall of the hill of vision. Widely separated isopters, conversely, indicate a more gently sloping contour. A. KINETIC TECHNIQUES: In this method, the test object is brought from a non-seeing area to a seeing area and the point at which it is first seen in relation to the fixation is recorded. B. STATIC TECHNIQUES: Here the object is stationary and the brightness, size and duration of the stimulus can be varied at each location. In actual practice during automated perimetry only the brightness is varied. Suprathreshold or threshold presentations can be employed. In suprathreshold static presentation the “on-off” technique is used in which the test object is kept just above the anticipated threshold for that particular point of the VF. The targets are momentarily presented and the points at which the patient fails to recognize the points are noted. In threshold static (profile) perimetry the relative intensity thresholds for the visual acuity of individual retinal points within the VF are measured. The target light intensity is gradually increased from subthreshold intensity and recording the level at which the patient first sees the light or decreasing the intensity from suprathreshold level and recording the lowest stimulus value seen. The tests can be done along a meridian radiating from the fixation point or along a circular line at a fixed point from the fixation. 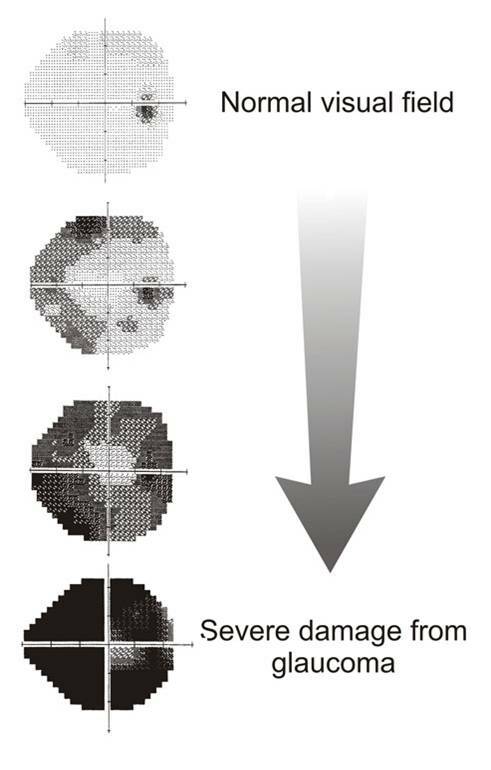 Threshold static perimetry is more sensitive compared to kinetic perimetry in detecting glaucomatous VF defects. 5. THRESHOLD: A “Threshold” is defined as the differential light sensitivity at which a stimulus of a given size and duration of presentation is seen 50% of the time. In practice, it is the dimmest spot which can be detected during testing. “Suprathreshold” is brighter than threshold stimulus. The stimulus can be made suprathreshold by increasing the size or duration of presentation. This is generally used for screening purposes. 6. 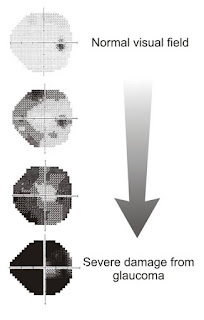 VF ASSESSMENT: Perimetry refers to quantification of the visual field. It can be done using flat screens (e.g. BJERRUM’S tangent screen) and known as “Campimetry”. This method can only assess the central 200 of the VF. When a curved surface is used e.g. LISTER, GOLDMANN or HUMPHREY, it is called “Perimetry”. 6.1. TANGENT SCREEN: It measures the central 300 of the VF. Mesopic lighting of 7 footcandles should be used in the test location. The patient sits 1-2 meters from the tangent screen made of black felt or flannel with a central white fixation target. Both kinetic and suprathreshold testing can be done. In the kinetic method, the examiner brings the test object from the periphery towards the fixation until the patient can see the target. The procedure is repeated at various intervals around the fixation in order to map the isopter. The stimulus value can be varied by changing the color and/or size of the test object. The isopter is designated by the ratio of TARGET DIAMETER to the DISTANCE BETWEEN PATIENT AND TARGET (both being expressed in millimeters). For example, “2/1000 white” means a 2 mm white target at a distance of 1000 mm (1 meter). Suprathreshold testing can be done by turning the disc-shaped test object from black to white or by a self-illuminating target with an on-off switch. The tangent screen is cheap and simple. However, these tests lack standardization and it is difficult to obtain reproducible fields necessary for follow-up of glaucoma patients. It also does not include peripheral fields which might be affected in early stages of the disease. 6.2. AUTOMATED PERIMETRY: Perimetry is performed by projecting the VF onto a hemispherical surface (usually in the form of a rectilinear grid). Automated perimeters present static targets with a random presentation (usually a rectilinear grid) to avoid the patient from guessing the target site. They also use an adaptive technique in which the stimuli are presented according to the presumed normal retinal threshold contour. This is adjusted to age-corrected normal data or the patient’s response to preliminary spot tests. The test objects are small spots of light (LEDs) which are projected over the adapting “background” (also called the “surround”). These strategies improve the balance between SENSITIVITY (the ability to detect defects) and SPECIFICITY (the ability to detect normal areas). 1. PATIENT: The attentiveness and response time of the patient during intra-test and inter-test sessions can determine the VF assessment. 2. PERIMETRIST: While manual techniques suffer more from perimetrist bias, automated perimetry can be affected by a lack of monitoring by the perimetrist. 3. FIXATION: If the patient’s eye is cyclotorted relative to the test bowl or if the patient’s point of fixation is off centre, defects may shift in locations to appear and disappear. 4. BACKGROUND LUMINANCE: The luminance of the surface onto which the stimulus is projected affects retinal sensitivity and therefore, the hill of vision. Perimetry is usually performed with a background luminance of 4.0-31.5 apostilbs. It is well known that retinal sensitivity is greatest at fixation and falls steadily towards the periphery. 6. PRESENTATION TIME: Temporal summation upto about 0.5 seconds can occur. In other words, the longer the duration of the presentation time, the more visible is the given stimulus. Usually the perimeters employ fixed stimulus duration of 0.2 second or less. 7. REFRACTION: Uncorrected refractive errors can blur and decrease the sensitivity of the retina to the stimulus. 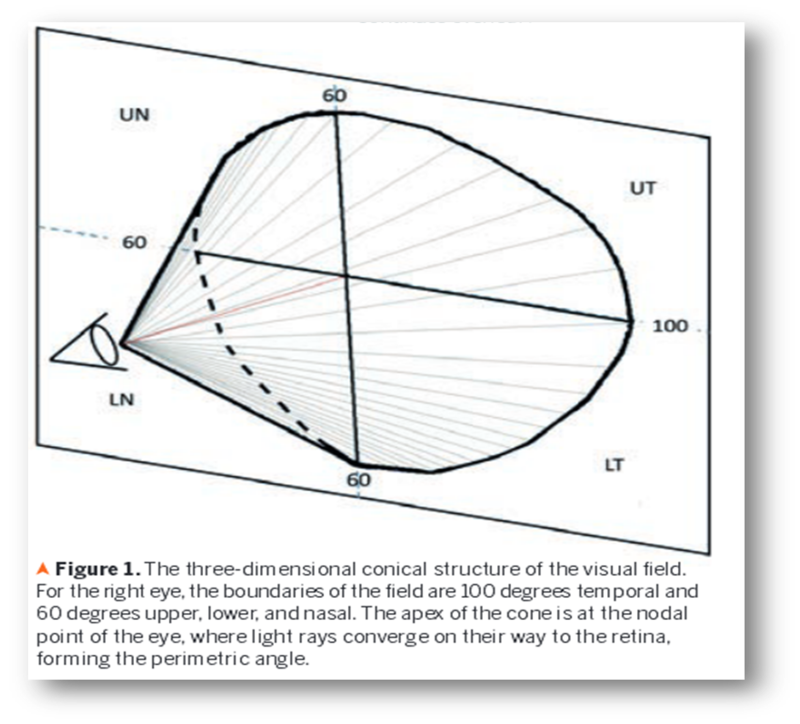 Presbyopic patients must have a refractive compensation which focuses fixation at the depth of the perimeter bowl. The patient should be centered close to the correcting lens in order to avoid a “lens rim defect”. 8. PUPIL SIZE: The pupil size should be recorded at each visit. A pupillary diameter less than 2.5 mm can induce artifacts. 9. WAVELENGTH OF BACKGROUND AND STIMULUS: Color perimetry can yield different results than white-on-white perimetry. 10. SPEED OF STIMULUS MOVEMENT: Since temporal summation occurs over a period as long as 0.5 seconds, the area of retina stimulated by a test object is affected by the speed of stimulus movement. If a kinetic target is moved too quickly the patient might respond only after the object has moved to another location. This period between visualization of the test object and response is called the latency period or visual reaction time.